I have a prediction and I can almost guarantee it will come true. Guar – an – tee. Like sure enough that if I was a betting woman and if they placed bets on things like ice cream or cookbooks or ice cream cookbooks, I would clean up in Vegas. 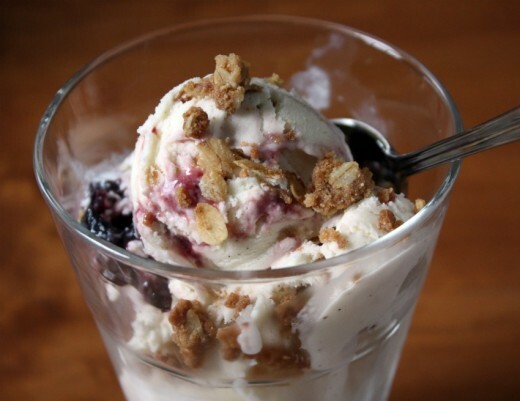 The internet is soon going to become overrun with recipes pulled from the Jeni’s Splendid Ice Creams at Home book. For real. It’s going to hit big and it’s going to hit hard, maybe not with the same strength as No-Knead Bread or the New York Times chocolate chip cookies, but strong all the same. This time I am on the cutting edge, not joining in the club two years after it has formed. “What is the big deal?”, you might ask. Have you ever made ice cream? Used lots of yolks, and had to strain out the scrambled bits? Made a truly delicious treat but with just a bit more iciness than you would like in your ice cream? This woman, Jeni, she has been making ice cream for years and she has nine ice cream shops (and counting) to prove that she knows her stuff. She doesn’t use eggs. At all. What she does is use a bit of cream cheese and cornstarch and a couple of tablespoons of corn syrup. The cooking method is streamlined – milk and cream get boiled together for exactly four minutes. A cornstarch slurry is stirred in and then the mixture boils for exactly another minute. Whisk the whole thing into cream cheese with a bit of salt, and you have the base for your ice cream. I’ve always thought that making ice cream was so easy for how delicious it is – now I think it’s even easier. In addition to coming up with and streamlining this process, Jeni has shared her treasure trove of recipes in a delightful book. They are arranged seasonally – seasonal ice creams! Who knew? I’m a person who likes to chew when eating ice cream and I love that there are plenty of add-ins, mix-ins, and pairings that make even the most routine flavor exciting. Graham’s eyes got really big when he saw the cover of the book. He immediately pointed to the scoop that looked like it had cherries in it. We made Cherry Crisp Ice Cream. 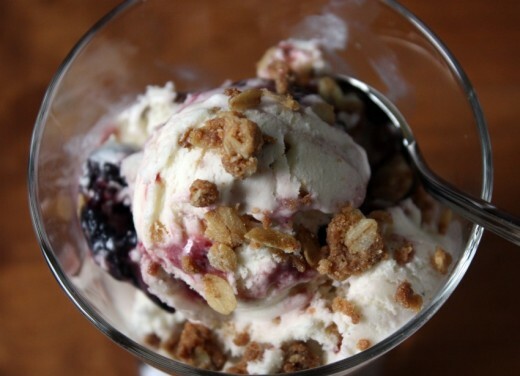 We roasted cherries, made the crispy bits (think a streusel on a cherry crisp), and used our new technique to make the ice cream. We licked the paddle (swoon! ), alternated the vanilla bean ice cream with the other goodies in the container, and put it away in the back of the freezer to firm up. The result? The boys did not like it. I had a feeling they wouldn’t. Their ice cream tastes are more simple. They probably won’t like the Sweet Corn and Black Raspberry Ice Cream which intrigues me, or the Black Walnut Divinity Ice Cream which does not. It might be that I have to use my other more traditional ice cream cookbook when making that special treat for them. As for Randy and I…well. Randy said it was the best ice cream I have ever made. Most recently I made a strawberry version (from another book) and both of us were turned off by how icy it was. This was the opposite. So creamy, velvety, not a hint of an ice crystal. This is totally Randy’s type of ice cream flavor and totally not mine. But holy cow was this good. I’m a little worried. If a totally-not-my-type-of-flavor has me dipping my spoon directly into the container over and over again, what am I going to do when I make a totally-me flavor? Mix about 2 tbsp. of the milk with the cornstarch in a small bowl to make a smooth slurry. Whisk the cream cheese and salt in a medium bowl until smooth. Fill a large bowl with ice and water. Combine the remaining milk, the cream, sugar, corn syrup, and vanilla seeds and bean in a 4-quart saucepan, bring to a rolling boil over medium-high heat, and boil for 4 minutes. Remove from the heat and gradually whisk in the cornstarch slurry. Bring the mixture back to a boil over medium-high heat and cook, stirring with a heatproof spatula, until slightly thickened, about 1 minute. Remove from the heat. Gradually whisk the hot milk mixture into the cream cheese until smooth. Pour the mixture into a 1-gallon Ziploc freezer bag and submerge the sealed bag in the ice bath. Let stand, adding more ice as necessary, until cold, about 30 minutes. Remove the vanilla bean. Pour the ice cream base into the frozen canister and spin until thick and creamy. Combine the cherries, sugar, and cornstarch in a 9-inch square baking dish, tossing to mix. Roast for 30 to 45 minutes, until the juices are thickened and bubbly, stirring every 15 minutes. Let cool completely, then chill in the refrigerator. Put all the ingredients except the oats in the bowl of a food processor and pulse until mixture looks like coarse sand. By hand, add the oats and mix well. Spread out on a baking sheet and break up any large clumps into crumbs about ½-inch in size. Bake for 30 to 35 minutes, until toasted and browned, stirring occasionally to prevent burning, especially in the corners, and to turn over the unbaked portions. Let cool completely, then freeze until ready to use. The streusel can be frozen for up to 1 month. I believe you are indeed on the cutting edge here. This is the it thang. I haven’t used the book yet and in fact am not sure where my ice cream maker is in my storage closet, but I fully and with all sincerity intend to. No eggs is 100% right on in my opinion! With this heat wave ice cream is a welcome treat Dana!!! How funny–I just made an ice cream mixture using her technique yesterday. But I haven’t frozen it yet. Now I can’t wait. I actually made a lavender flavor–which surprisingly I wasn’t crazy about. But it’s the texture I’m interested in checking out, as, like you, I’d love to omit the egg cooking from ice cream recipes. For two years I’ve been resisting (bravely, I may add) buying an ice cream maker. 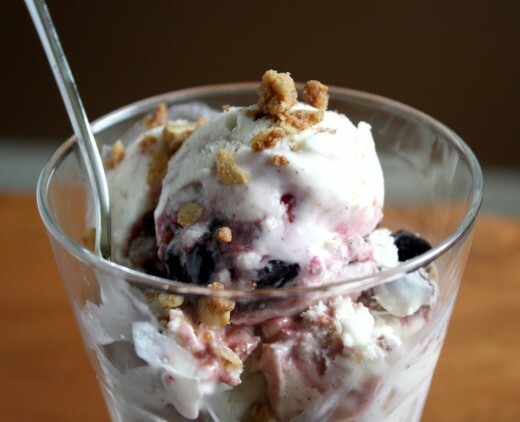 I live in Ohio and LOVE Jeni’s Splendid ice cream – fun to know that we could attempt to make it ourselves! This sounds like one dangerous dangerous book given that I have a frozen ice cream maker in the freezer…and I’m ready and willing to use it! I love that there are no eggs in it…I am always panicking about scrambling them before their time! Ahead of the curve indeed – just opened my Splendid Table weekly e-mail and you beat Lynne RK to the punch! That’s 2 trusted cooks saying “try it” – seems like a go to me. We go through fits and spurts with our ice-cream maker and it sounds like it’s time to haul it out again. I adore this! Thank you for sharing. While I love making ice cream at home I am always put off by using huge amount of egg yolks because I never know what to do with the whites. I will definitely give this a try! I have never made ice cream before and this looks so tempting I just might have to try making it…and I love that she doesn’t use eggs! I agree; I think there will be waves and waves of her recipes all over the internet. And she seems to be fine with that! I think she knows that plenty of us will try a few out and then go back to her for the real thing (some are just too complex for me). Luckily, here in Nashville, we have two places (including a Jeni’s store) to get the ice cream! I think you’re absolutely right about this book! I was completely intrigued when I first heard about the cream cheese in her ice cream base. I’ll probably be two years behind when I finally try it, but I’m looking forward to it. The cherry crisp add ins sound divine. dana why does someone add in cornstarch to the ice cream batter? what am i missing here? a texture thing? When I first visited Jeni’s in Ohio (my husband is from there) I could tell I was in a very, very special place. Her flavors are so unique and I’m definitely with you…ice cream – it’s where it’s at. 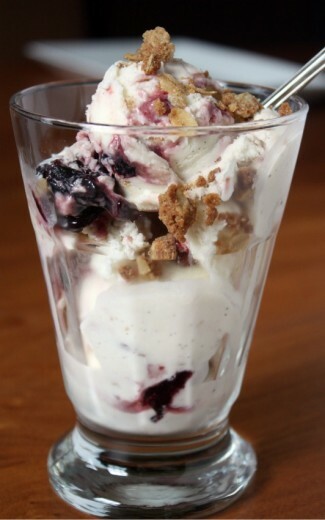 heyy I made this today with the exception of using matcha rather than the cherries and streusel.. and while the consistency was to my liking… I could still taste the cream cheese somewhat.. in the ice cream.. I think maybe it was because I didn’t use any additional flavorings (ie vanilla extract) Would there be a better alternative than using vanilla to get rid of that cream cheese after taste? Thanks for any help in advance! holy crap. I went straight out and bought the book, after looking at Jeni’s shops’s website. I came back home and drooled and exclaimed, and got extremely excited. I made the Goat Cheese and Roasted Cherries. I wished I had ‘boozed’ the cherries, but it was fantastic. Yesterday I made Backyard Mint. As a chef who loves local-sustainable-seasonal, and well-researched, well-explained methodology, along with beautifully creative flavor combinations….well. I am in love. Too bad you didn’t like this ice cream flavour! I’m really intrigued by this different method for making ice cream.